Andi Gladwin is the co-founder of Vanishing Inc. magic and a very accomplished close-up artist in his own right. This week he ventured from him home to take in a taping of ITV’s series Penn & Teller: Fool Us. It’ll be a series of six or seven shows featuring mainly British magicians, but with a few from Europe and farther afield. The show will be hosted by Jonathan Ross who made hosting the show look effortless. He’s funny, professional and clearly in love with magic. 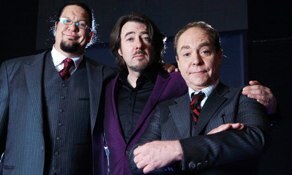 Penn & Teller were incredibly respectful of the artists and didn’t go too far with exposing magic. I won’t describe the performers that I saw, or whether they fooled Penn & Teller, but it certainly was an interesting and sometimes unexpected line up. There must have been well over 1,000 people queuing for a place in the audience, which was limited to less than 400 places. Lots of people were turned away, but if the reaction of the people that got to see the filming is anything to go off, this will be a popular series that shows magic in a good light. Fool Us taped six episodes this week and it will air on ITV in the coming months. The first edition of Fool Us, aired in January to rave reviews.